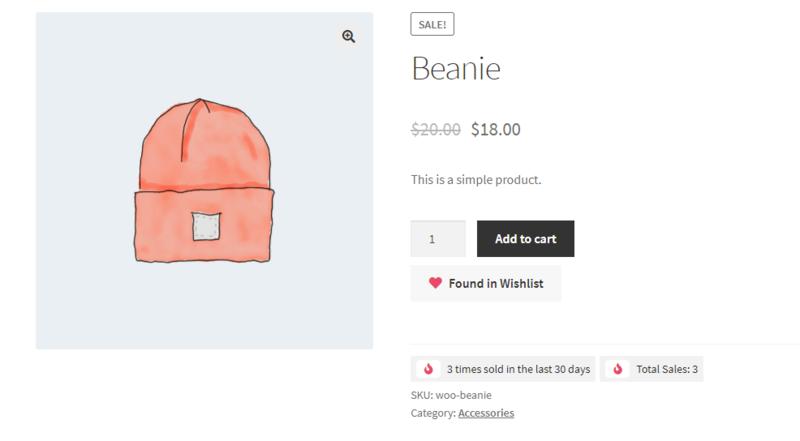 Wishlists enable customers to add their most wanted products to specific lists. Customers can set wishlists to private, public or only visible to people who they shared a unique link with. Shop owners can analyze wishlists to see which products people are most interested in, show related wishlists to certain products or send out targeted promotions. There are many more features that come with the wishlist functionality. The following pages guide you through the features and the settings that are available to you. Each button has two states, an active state indicating that the current product is already in a wishlist and another one that shows that the product is not in any list. Each button state can have a separate styling. 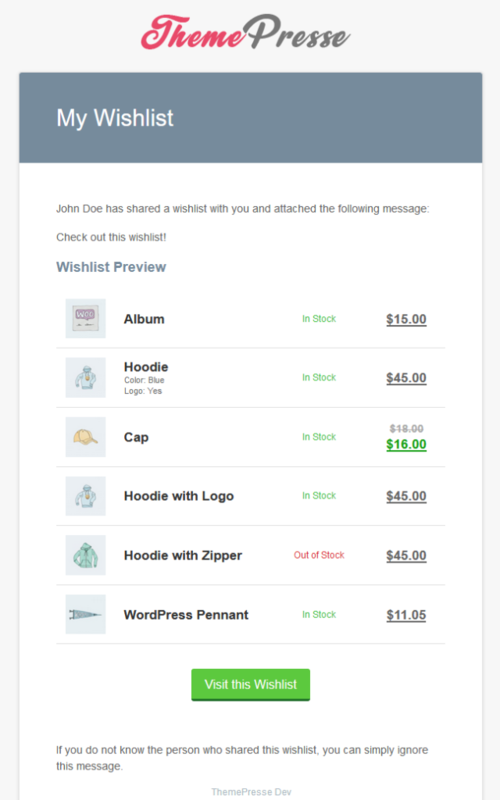 We also differ between wishlist buttons for customers and visitors. This enables you to style your visitor buttons in a different way then for customers. 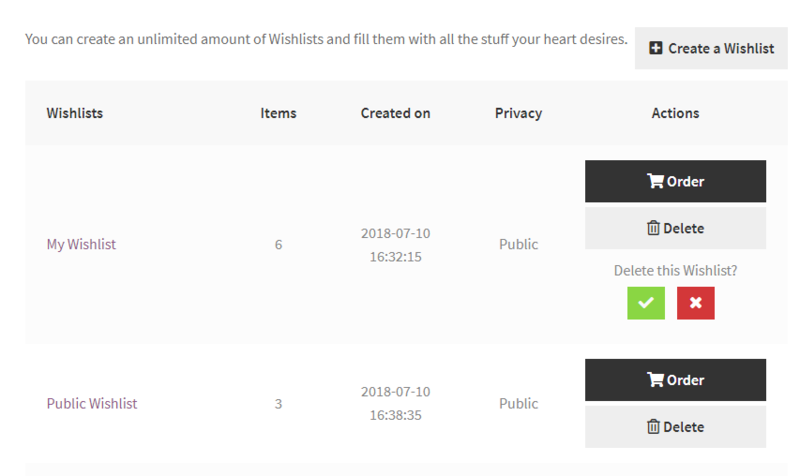 On wishlist pages, these include shared wishlist and my account wishlist pages the add to wishlist buttons can also be styled separately. Users can set wishlists to different privacy settings. These settings enable customers to keep wishlists to themselves, share them with anyone or only share them through a unique link. Users can opt-in to receive product promotions and price informations for products on a per wishlist basis. 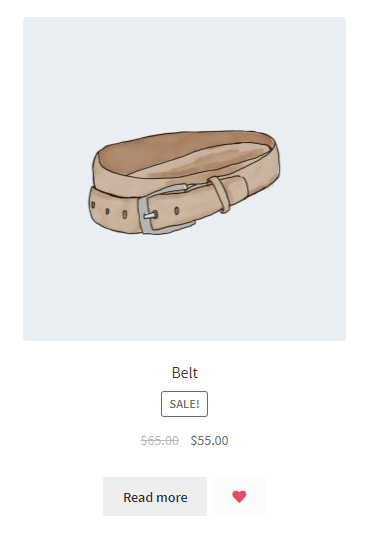 This enables shop owners to target people with special promotions like sending out coupon codes directly to people who are interested in a specific product. 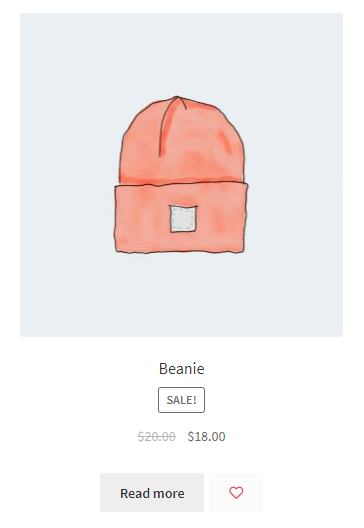 People will also receive automated notifications if a product in their wishlist goes on sale or simply drops in price. 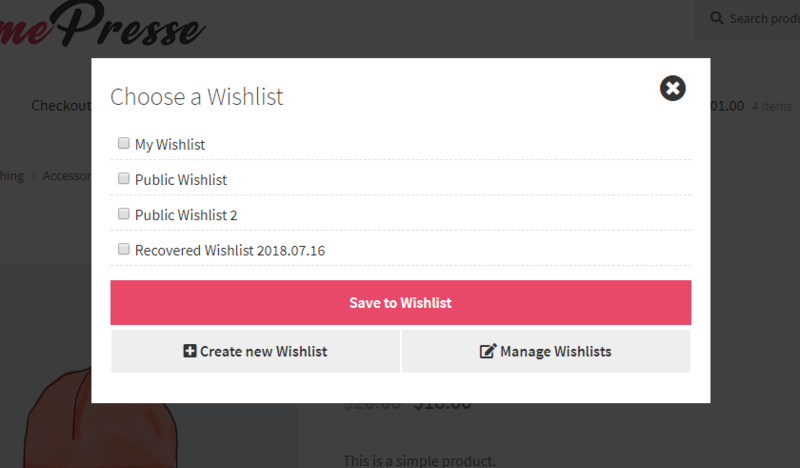 You can choose where you want the wishlist button to be displayed on product categories, its also possible to define your own wishlist icons, add text to the button and change the colors. 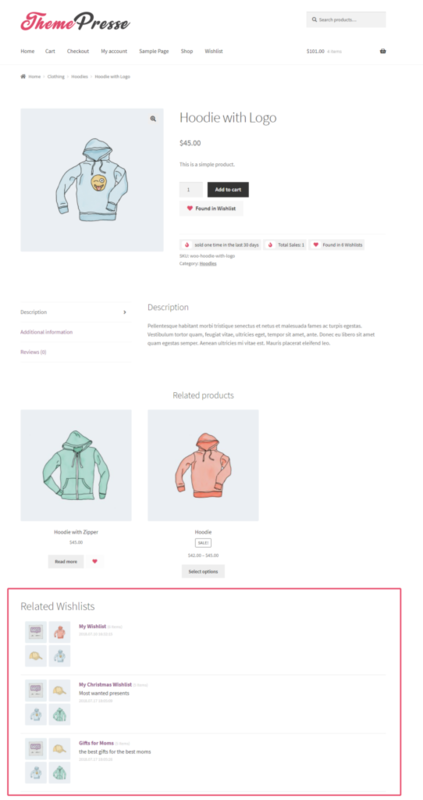 Wishlist buttons are not displayed on variable products, customers instead have to first select the variation they want directly on the product page. You can set different styles for buttons depending if the current product is already in atleast one wishlist or not. We also seperate between customers and visitors. Customers can create more then one wishlist. To quickly manage these wishlists they are presented with the so called „Wishlist Selector“ once they click on the add to wishlist button. 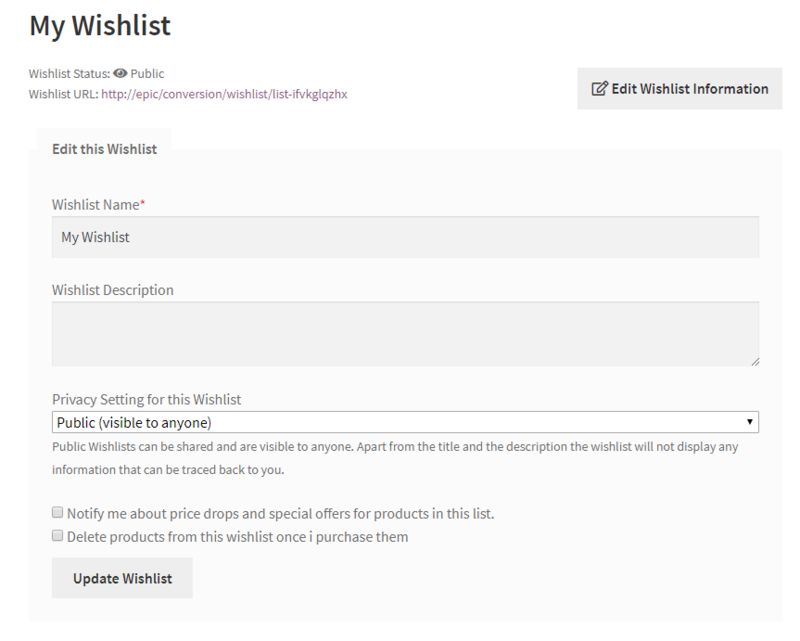 Inside of the wishlist selector customers can add the product to desired wishlists or directly create a new wishlist. 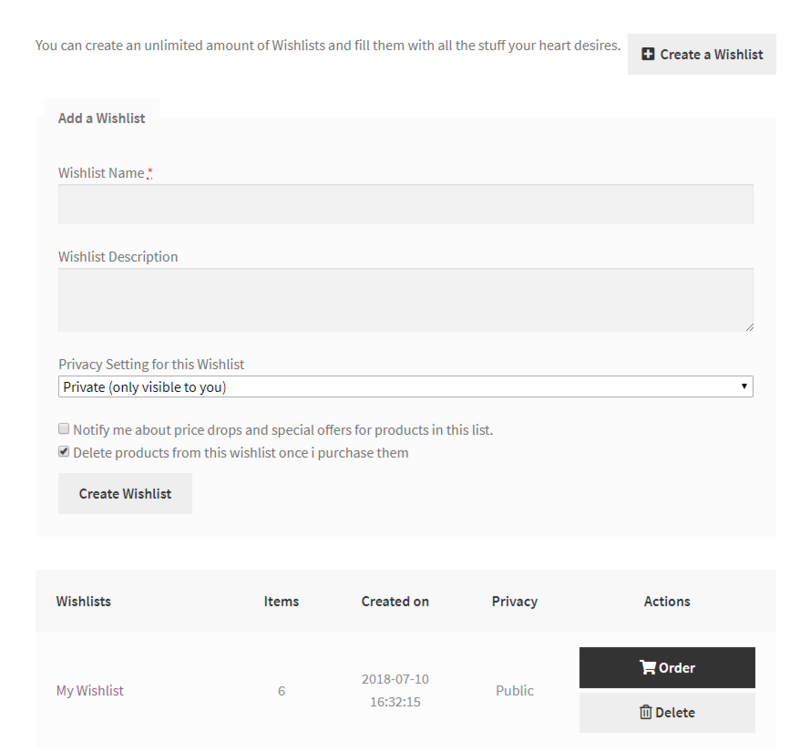 Customers can set a name for wishlist, an description, set a custom privacy and choose wehter they want to receive promotional material for products inside of that wishlist. The new wishlist will then automatically be appended to the list of available wishlists. There are three shortcodes that can be used on wordpress pages. Customers can manage their wishlist in their „My Account“ page. By clicking on the „Wishlist“ tab they get presented with the following page. 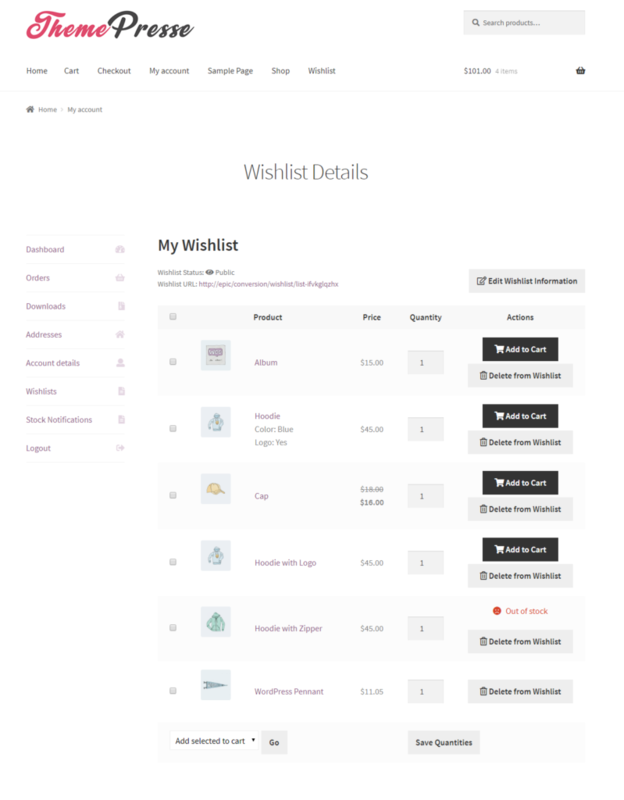 Customers can delete complete wishlists, order all items in a wishlist or create a new one. Before a wishlist gets deleted the following security question pops up. If a customer chooses to create a new list the following form pops up. 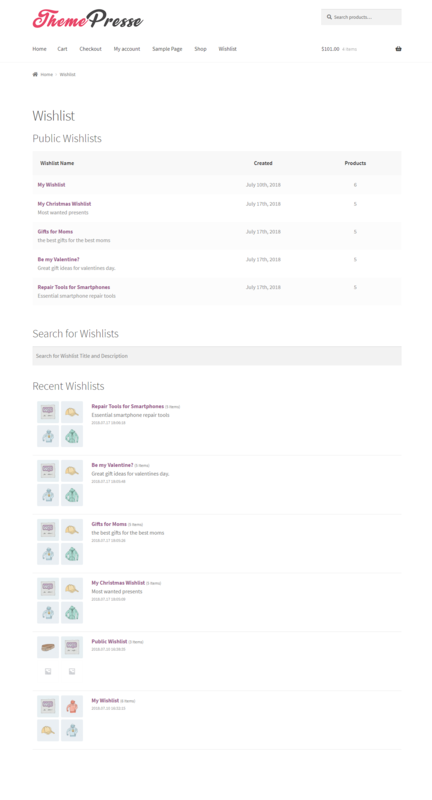 Customers can manage the contents of each wishlist. They can delete products from a list, perform bulk actions like adding several products to their shopping cart at once or change quantities. They can also change the name, description, privacy and promotion settings for the wishlist. Next up the edit form. If customers browse shared wishlists they are able to add products from the list to their cart or their own wishlist. They can also copy the whole wishlist. Admins also see a little edit button which takes them directly to the backend settings for the particular wishlist. The wishlist part of the plugin comes with two widgets. 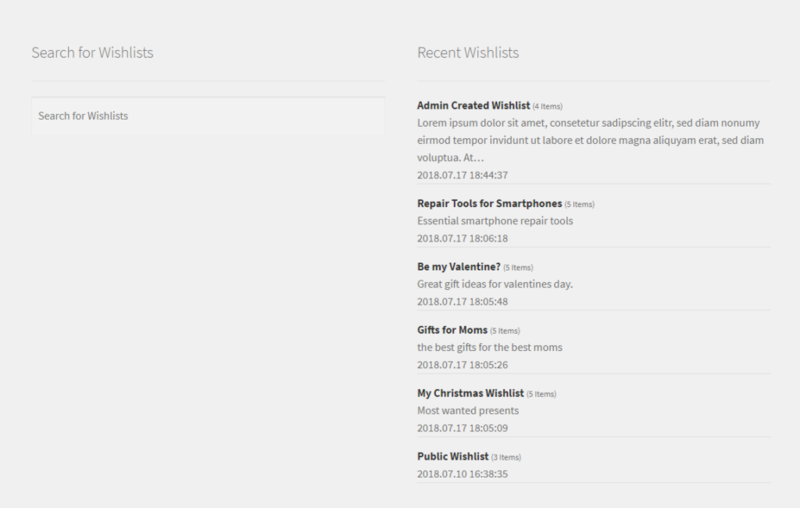 A widget that displays the search form and another one that displays recent wishlists. Wishlists can be used to cross promote other products. 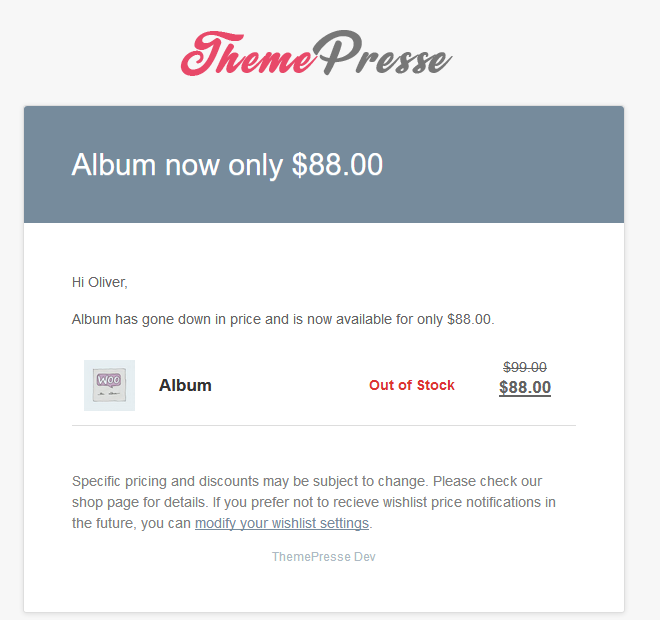 This can be used on product pages and on the cart page. 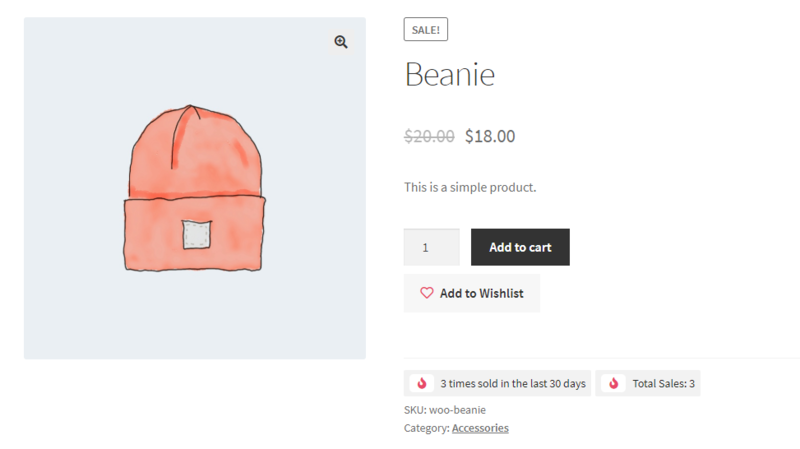 Shows customers products from their wishlists directly at checkout. Example of a wishlist shared by the mail form. Texts and styles can be changed from within the admin settings. 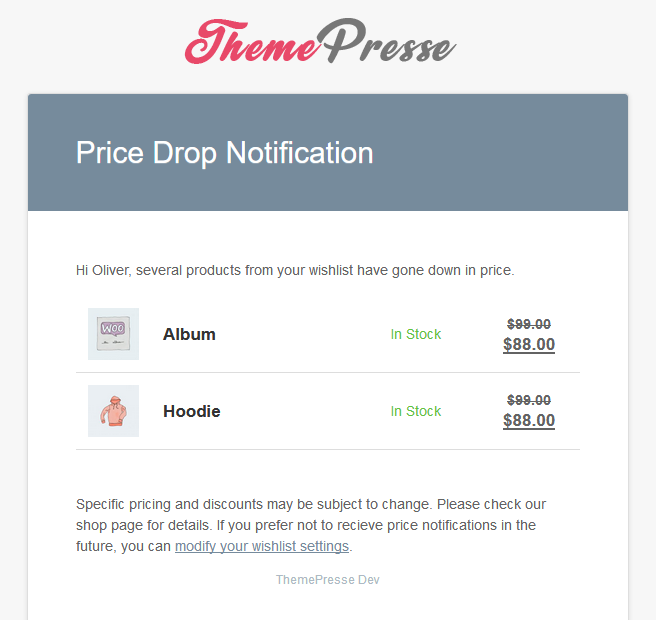 Automated notification that gets sent out to customers if a product from their wishlist drops in price. The threshold for this mail to be sent can be specified from within the admin settings. This mail will also only be sent to customers who chose to receive this kind of notifications. Automated mail that gets sent to customers if more then one product in their wishlist has gone down in price. The style and text of this mail can be changed inside the admin menu. Shop owners can send out targeted promotions with coupon codes directly to customers who have a specific product in their wishlist. 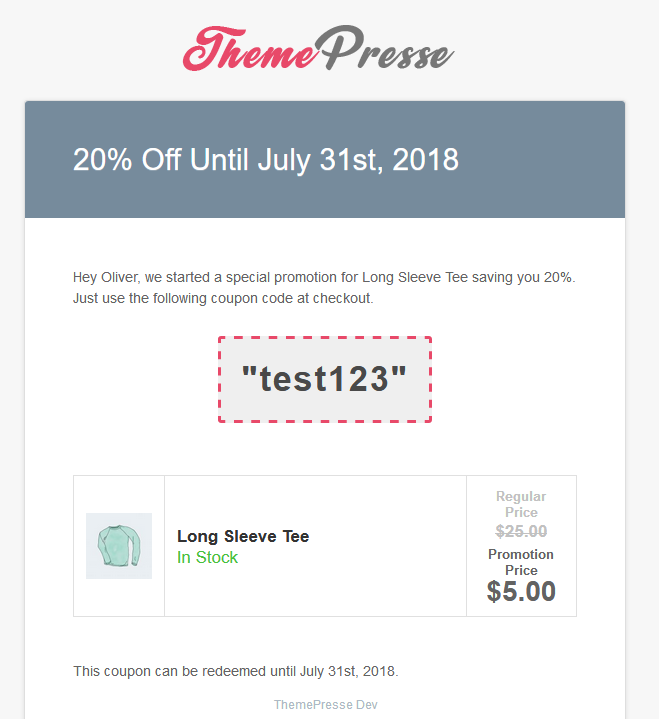 You can also send out emails with other kinds of promotions without coupling it with a coupon code.